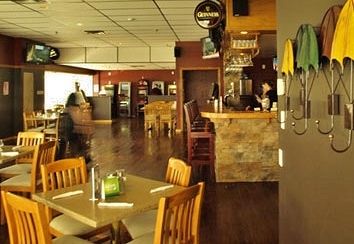 Tom and Joanne Byrne’s Red Rock Bar and Grill on Topsail Road is about to roll out a refreshed menu created by new chef, Michael Wozney. 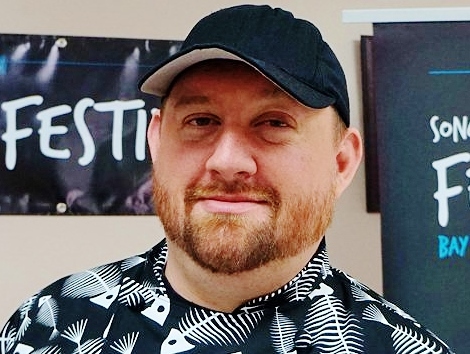 After graduation from Holy Heart of Mary High School in St. John’s, Chef Wozney studied culinary arts at Vancouver’s Pacific Institute of Culinary Arts. He brought his 15 years of cooking on the mainland to an end at Chop Steakhouse and Bar in Edmonton, Alberta. It was a good warm-up for his debut at Red Rock. Summer squash soup with a dash of fresh cream was the soup of the day, but it was more assertive than straightforward puréed squash. Adding to its high viscosity with texture (and flavour) were corn and cubed ham. This was anything but a light, summery soup. Yet, it was exactly what was needed on an unseasonably cold and damp St. John’s July evening. By calculation or intuition, Chef Wozney knew that this was the right soup to make on that particular day. 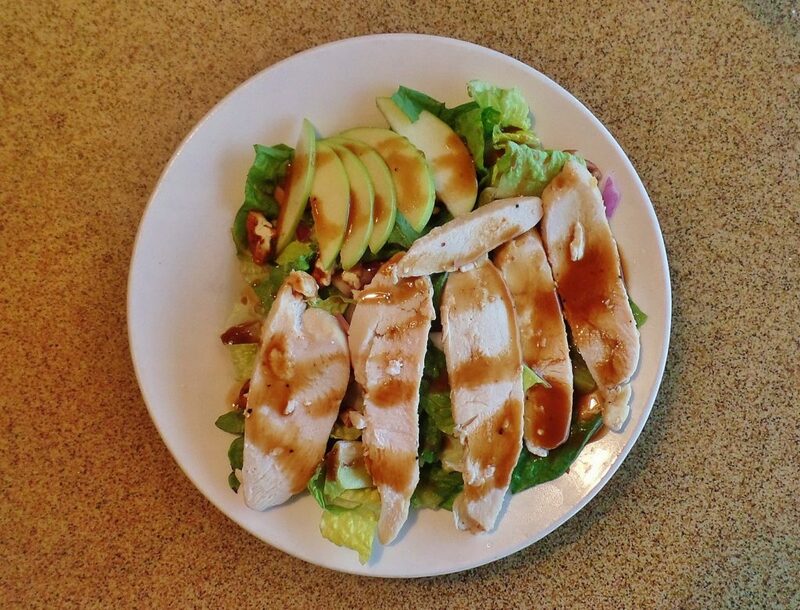 Red Rock’s new menu has maintained some of the more popular items, the house salad for one. Most impressive on this plate of carefully chosen fruit and veg were the slices of chicken arranged on top and drizzled with Red Rock’s own maple balsamic vinaigrette. The white meat was beautifully juicy and tender. A menu description indicated that the chicken had been marinated. If this helped make the chicken more tender and juicy, then please keep marinating. I was tempted to ask Mike Wozney if he learned how to make cod au gratin from his grandmother. Red Rock made the servings individually in round baking dishes, but the result was exactly what I know many of us remember from our mother’s or granny’s casserole. A cheesy top layer, freckled with more gold than Alfred E. Neuman’s cheeks, gave way to a rich custard of cheese sauce and fresh cod. On another occasion I stopped by Red Rock for a quick lunch. I picked a good day because lamb burgers were on special. Mine was a thick burger where the lamb made only a glimmer of space for token shredded lettuce. Red Rock’s rich tasting burger had full-on lamb flavour – just the way I like it. 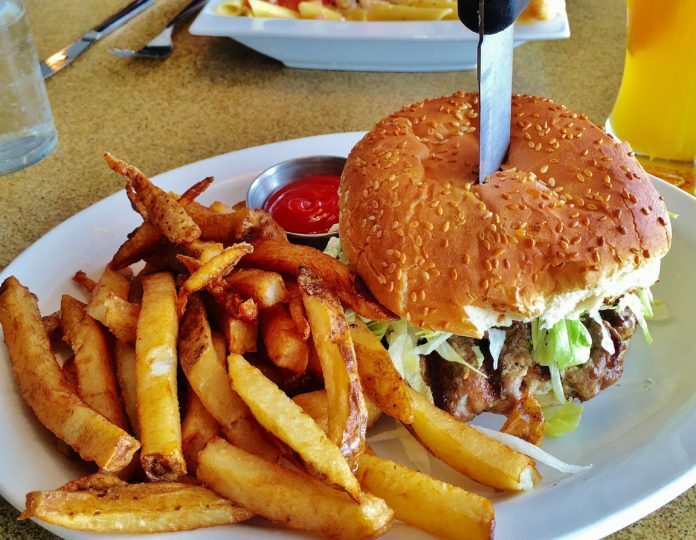 There was no mistaking this sandwich for anything but a lamb burger. Stuffed chicken breast has always been the default entrée for restaurants who want to cater to every palate, including, dare I say, the unadventurous. I usually avoid it because it’s something you can cook easily and often better at home. 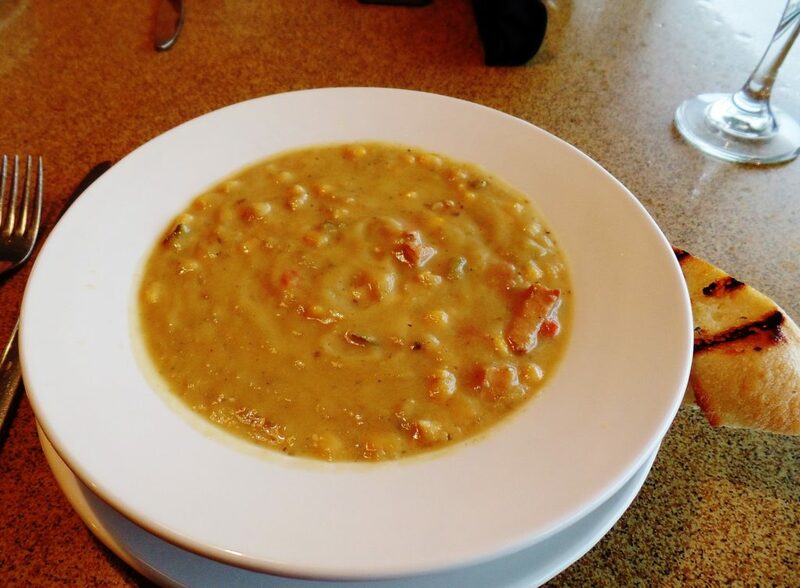 It’s one dish that most restaurants prepare perfunctorily, meaning it ends up tasting bland and boring. Chef Wozney’s stuffed chicken breast was the exception. Not because he strayed far from the traditional Newfoundland recipe, but because he actually made the time and effort to do it properly. The stuffing was flavourful and rich, the chicken tender and delicious. 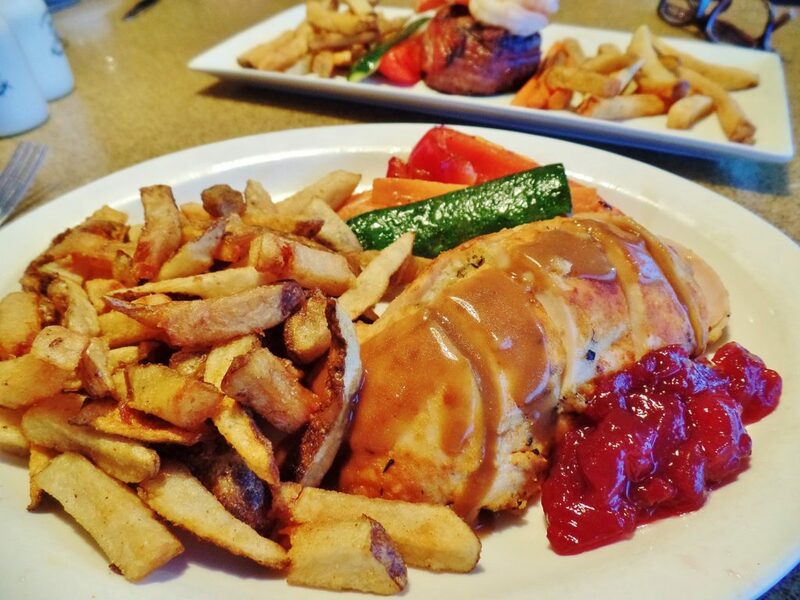 Homestyle gravy, cranberry sauce and perfectly cooked vegetables helped make the humble stuffed chicken breast a meal I will remember. If there’s a star entrée on Red Rock’s menu it’s steak. In addition to the listing of steak types (all aged certified Angus) sauces and complements, there’s a pictorial doneness chart that shows how a rare, as opposed to medium well steak, and so on, should look. No doubt some diners find this quite useful. Of course, without a competent grill chef the guide is worthless. 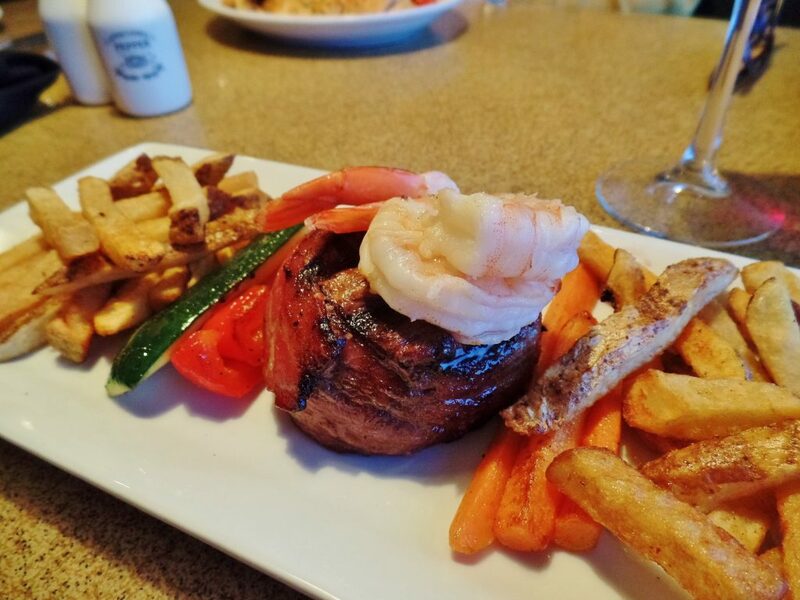 I ordered the steak special: bacon wrapped grilled tenderloin with sautéed jumbo shrimp and vegetables. My medium rare steak was exactly right, not to mention incredibly flavourful, and the shrimp were succulent. Honours must go as well to Red Rock’s hand cut French fries. They were golden, crisp outside and soft on the inside. 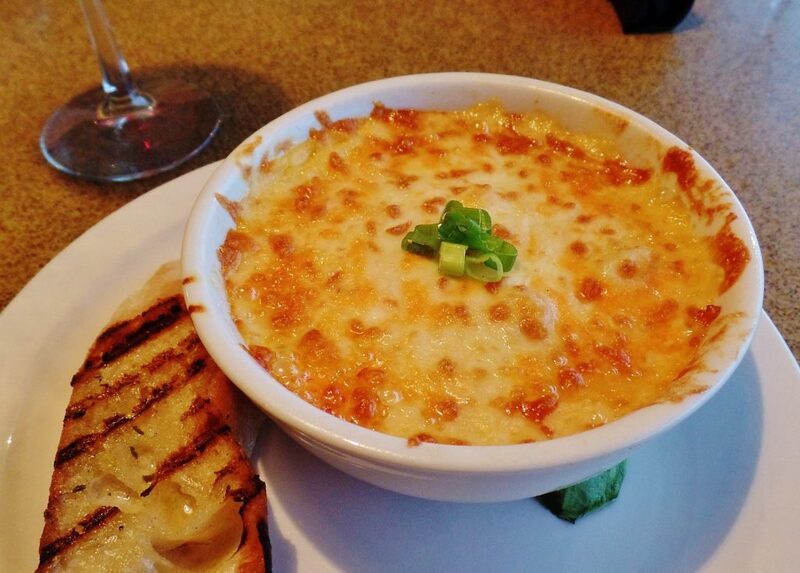 Red Rock is definitely rocking these days with better food, fine service and live music (in the pub) on weekends. The restaurant with the solid name appears to be on a very solid foundation. Service Friendly, informed and upbeat. Ambiance Lots of windows and light colours cheer up the pub half of Red Rock. A somewhat subdued dining room might benefit from new, brighter décor. Open Daily: 11:30 a.m. to 9 p.m. Friday and Saturday: 11:30 a.m. to 10 p.m. Parking A large lot is available. Wines Red Rock offers 15 wines (mostly mass produced New World) by the bottle. Prices range from $33 to $65 per bottle. House wines are very reasonably priced between $6 and $7.50 per glass. Wheelchair access Assistance may be required to open doors at the main entrance. Many tables are accessible. Restrooms are accessible.